When you select used file cabinets from ROF Furniture, you can choose from as-is condition or upgrade to refurbished, allowing you to choose your paint, among other specifications. Because ROF does all of our refurbishing in-house, we can customize your used file cabinets to fit your needs. To repaint our used file cabinets, we use economically and environmentally friendly powder coating, meaning that you can not only choose your paint color, but also be sure that whichever paint you choose will be long lasting and beautiful. Description: Refurbished Steelcase Mobile Pedestals with Lock and Keys. 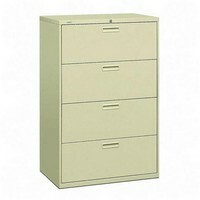 Description: 4 Drawer Fire File with Lock and Keys. Good condition As-Is, can be painted to your choice of color. Wood Storage Cabinet/Buffet Table with locks.